Remember the what? Yes, remember the nubbins? Yesterday one of our customers came in wearing the nubbins! Let me tell you about nubbins. They are little fringy fun, funky things that you can put on the edge of things. My friend Kim used to walk around the store wearing a nubbins scarf and I always wanted one. Our customer yesterday inspired me to knit one. She was kind enough to share the directions with me so I am going to share them with you. bind off the 10 stitches you just cast on. 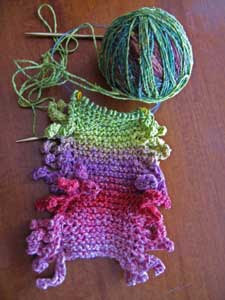 knit to the end of the row. So many of you have been asking about who the guy is that is working at the studio on Sundays. That would be my son Nik...this store is in his blood. 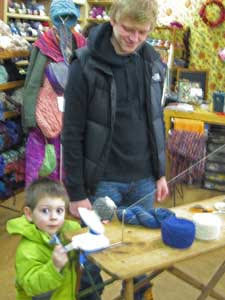 When we first opened he was there many a day and learned to knit. At that time many of the scarf samples that hung about the store were knit by him. Nowadays he is working on Sundays because I needed some extra help, he needed some work and he knows the store. A couple of weeks ago one of our customers brought in her son Parker. Nik was winding yarn for someone and Parker was totally taken by the whole ball winder, swift thing so Nik taught him how to do it. The next Sunday Parker came in looking for Nik and the ball winder. His mom tells me that he talked all week about the whole process....sooo it looks like Parker is going to be one of our new regulars!